We-Ambassadors: How cool is THIS? I have been sick (thanks to all the germ infested people who contributed (you know who you are!)) and feeling like poo! It is hard to stay focused or be motivated to do anything. 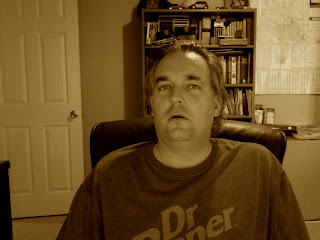 This picture is how I felt this morning: But then something happened that changed my day! There was a knock at my door just as we were sitting down to "study" the Price is Right (for church of course). I figured it was Jason with some work related stuff that I was not motivated to do anyway. But to our surprise, it was two of our church kids and their dad with a little (ok BIG) pick-me-up gift. And wouldn't you know it, I was just getting hungry! While it probably wasn't the best choice for a lunch, it sure was good! So, guys, it you are reading this: Thank YOU VERY MUCH it was HUGE mood raiser for Sheila and myself! Thank you, Thank you, Thank you! I feel much better and this stuff is awesome! 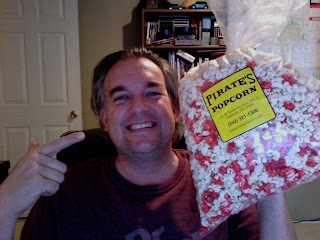 I have to go by Pirate's Popcorn and check out some more flavors! I had some for the first time the other day. It was amazing. And I got some too! Thanks Jon and the rest of the Daddy Daycare crew. You really do rock!